After the tragic events of September 11, 2001, ceramic studios around the world joined together to offer a creative outlet to the people of our nation. 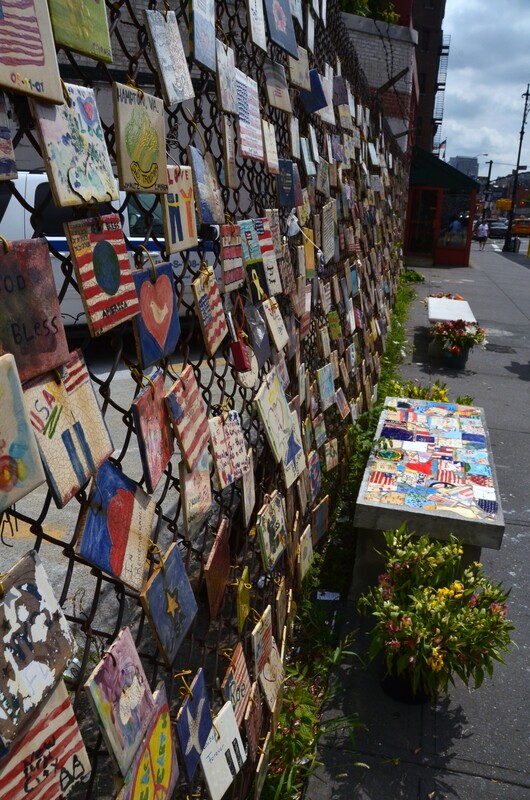 Thousands of tiles, reflecting patriotism, heroes, courage, unity, poetry, and other positive themes arrived in NYC. The “artists” are represented worldwide and have been families, children, schools, churches, scouts, and senior groups. Each tile reflects the artists’ thoughts of sadness and hope in the face of this American tragedy and once again, shows that the American people will pull together in times of national disaster. New York’s first memorial is located on a chain link fence at the corner of 7th Avenue and 11th Street. Beloved musician and New Yawker CYNDI LAUPER will be our guest! This entry was posted on September 10, 2012 by newyorkcityinthewitofaneye. It was filed under DAILY PHOTOS WITH STORIES OF NEW YORK CITY and was tagged with 9/11 memorial, Greenwich Village, Hans Von Rittern, New York City, Tiles For America, World Trade Center.